2014 begins, as many years do, in January. The Rockers traditionally don’t play their first competitive game of the year until the league’s anniversary in mid Feb, so the first few weeks are focused on getting back to full fighting strength after the festive break. 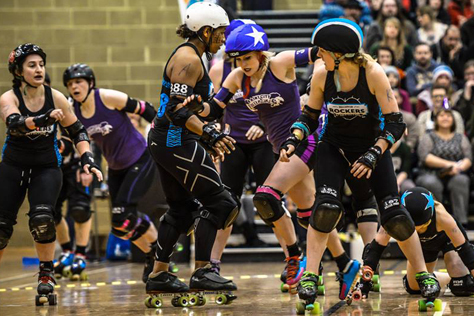 The year’s training regime sees the Brighton side link up for the first time with CrossFit Connect, who have put together a roller derby specific cross-training programme for the league. These sessions supplement 2014’s more nomadic and changeable than usual training schedule. With the Rockers’ regular venue, GYSO in Shoreham, closing its doors on January 3rd, training will be split between Hove’s King Alfred and the smaller Moulsecoomb Leisure Centre. 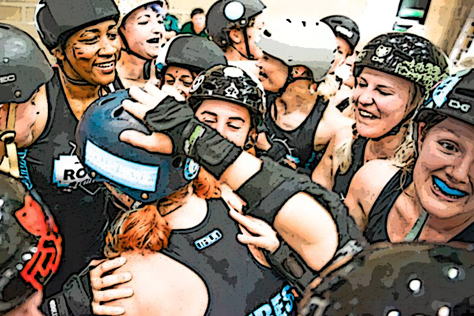 After the nerve-wracking comeback against Rainy, there’s an even narrower Brighton home victory four weeks later on March 15th against Paris Rollergirls. 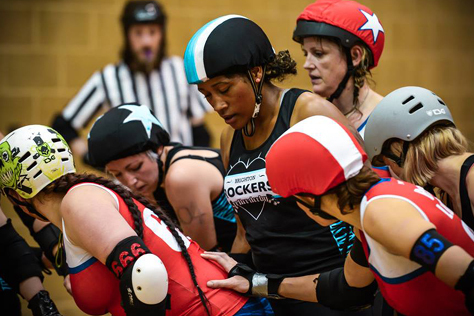 With much of the UK derby community’s attention focused on Birmingham, where the inaugural Men’s World Cup is taking place, the Rockers are nearly 100 points behind at half time in Haywards. The Sussex skaters won’t give up though, and the final few jams see them edge past their French opponents to take it by four points. Yowser! (REPORT) As if this isn’t enough excitement for the month, two teams of Rockers face off against each other in the Warrior Run, a punishing obstacle race, on the 30th, raising over £700 for the league in the process. A quieter April sees no public events, but the Rockers use the opportunity to commence their second Fresh Meat programme of the year. Later in the month, the league hold an open session for those interested in derby as part of the TakePART Sport initiative. There’s another home game for the A-team All-Stars on July 26th as they take on near neighbours Croydon at the Dolphin. The rankings website predictions are expecting a comfortable Rockers win here, but the visitors play tight and tough to keep down Brighton’s margin of victory. (REPORT) The game marks the retirement of Rockers legend Mistress and also sees the launch a huge new range of league merch, with multiple T-shirt designs, badges, bottle openers and more. (T-SHIRT SHOP) Aside from Shambolic’s fundraising piercathon at league sponsors Punktured – and the small matter of captain Racey’s wedding – the Brighton skaters take things fairly easy in August. As do we at BRATS… shamefully it takes us nearly two months to post our report on the Croydon game. Oops! October sees us initiate the most ill-judged contest ever. A photograph of BRATS member Maki sporting one of our baseball caps in Reykjavik encourages us to ask fans to send photos of themselves wearing one as far away from Brighton as possible, with the winner getting… er, a BRATS baseball cap. The rest of the year sees Maki and another member, Mr Dean, trying to outdo each distance-wise. Back on home soil, the Rockers realise an away game is long overdue and make the short trip along the cost on the 25th to take on Portsmouth Roller Wenches. It’s another close but well fought victory for the Brighton league. (REPORT) Moving into November, the Rockers blag their second big name signing of the year. Former Eastbourne head coach and captain Swann joined over the summer, and this month sees the arrival of one of Croydon’s most iconic skaters, Gin Atomic. The South Londoners receive Rockers ref Banger as part of the transfer fee. 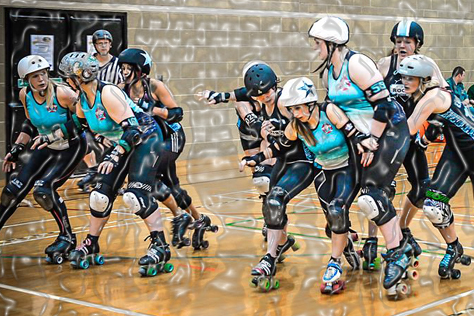 Gin has barely trained with the Rockers when she’s thrown into action, with the league sending a small mixed level squad up North to play Manchester Roller Derby on the 22nd. (REPORT) As with the Lille trip, the result might not be the one Brighton wanted, but the opportunity to give some newer skaters gaming experience could prove invaluable. Especially as the Rockers – who have never really had that big a roster – will need to select a 20-woman squad for British Champs. BRATS celebrate our second birthday by shamelessly interviewing ourselves. (BIRFDAY) We also fix it for a new board game to feature a zombie version of Sham in her Rockers kit as one of its figures. (ZOMBN1) The year comes to an end, as most years do, in December, which is pretty quiet. Keep an eye on this website for our 2014 Awards, plus a look ahead to the Rockers’ much anticipated 2015 National League South campaign. Yay! Note: British Champs released the incorrect fixtures/venues online. The ones we carried here previously were wrong. These are correct. 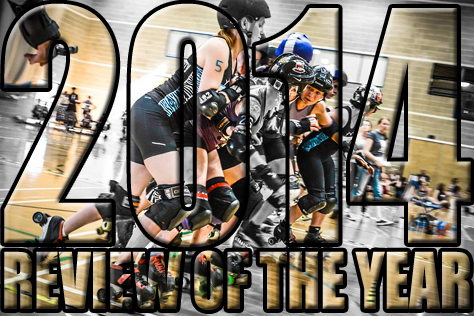 This entry was tagged 2014, BRATS, Brighton Rockers, Review of the Year, roller derby, rollerskating, sport, UKRDA, women's sport.